A Methodist 'Circuit' is an association of churches grouped together in a geographical area. Ordained Ministers or Presbyters (and Deacons) are appointed to serve a Circuit. The Superintendent Minister is responsible for the work of all the churches in the Circuit. The Richmond and Hounslow Circuit is part of the London District, whose logo is reproduced above. The District covers more or less every Methodist church within the M25. The Circuit has a Leadership Team, which consists of the Staff (Ministers and Layworkers), the Circuit Stewards, and the Circuit Treasurer, together with the Administrator who looks after the Circuit office. The Team reports to the Circuit Meeting, which supervises the work throughout the area. Unusually, the Richmond and Hounslow Circuit is both north and south of the Thames, as the river winds its way through south-west London. 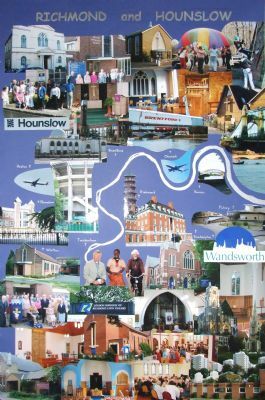 The area covered by the Circuit includes parts of the London boroughs of Richmond Upon Thames, Hounslow, and Wandsworth. The banner (above) was prepared for the launch of the London District in September 2006. It depicts some of the activities, buildings and people involved in the Circuit. Football clubs, the rugby stadium, Heathrow, a parachute game, blocks of flats and a mosque may not be obvious Methodist images, but they're part of the life of this part of London, and we're glad to show them on our banner!